My fascination with art began as a young child producing masterpieces for my doting grandparents; standing at an easel in kindergarten, painting bold and vibrant pictures; drawing pencil portraits of my elementary school friends; taking art classes as a young mother and then painting at home with my pre-school children. Despite several years' hiatus, my enthusiasm for creating art was never lost. So here I am, an octogenarian now, painting every chance I get -- delighting in sharing my work at local art venues -- selling some, winning prizes from time to time -- having fun. My art keeps me alive. I thank all those who have helped along the way: my family, my teachers, fellow artists and famous ones whose work never fails to inspire. I am grateful. Come see my paintings and give me your feedback. I would love to hear from you. ©Laura Reynolds, Pelicans, Lakeland, FL, Watercolor, 24 x 20 inches. 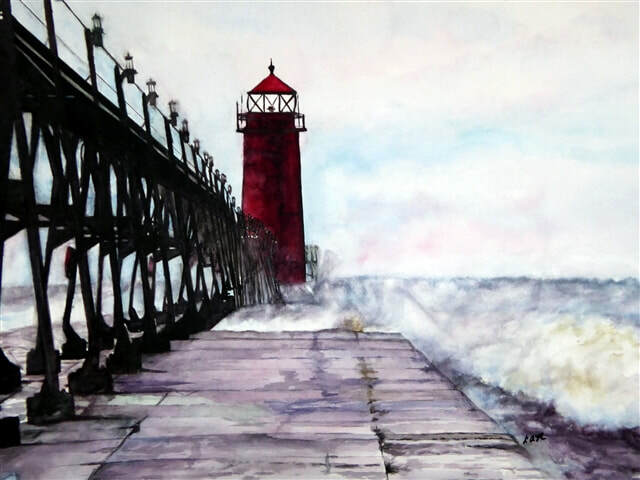 © Laura Reynolds, The Sentinel, Watercolor, 20 x 24 inches. ©Laura Reynolds, The Yellow Flower, Acrylic, 22 x 27 inches.